And now we find ourselves in a situation where legislators dabble in washroom usage. This may appeal to one small, vocal corner of their support, but it’s not good for business. Meeting planners and the hospitality sector, which is one of the largest and fastest growing industries in the world, are not helped by such intrusive legislation. Planners already live by the maxim: plan for the best, but expect the worst. Traditionally, disruptors came from Mother Nature who visited hurricanes, tornados, earthquakes, volcanic eruptions and raging blizzards on business. Then came the disruption of terrorism. Now a new disaster category has been created by politicians whose local laws conflict with the values and beliefs of non-partisan organizations and businesses. Someone with first-hand experience is Dr. Barbara Risman. A professor at the University of Illinois in Chicago, Risman was president of the Virginia-based Southern Sociological Society (SSS) when she cancelled her 1,200-person meeting scheduled for 2019 in Charlotte, North Carolina. 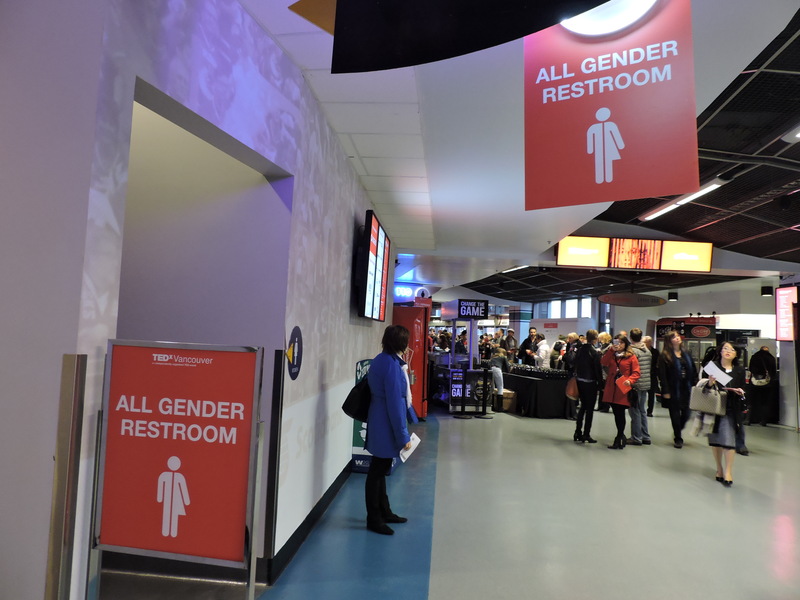 Under neutral washrooms at the Rogers Centre in Vancouver for the TEDx Talks. The Westin’s sales manager told The Charlotte Observer the cancellation was a $180,000 loss to the hotel. Legislators, who are normally deeply in the “pro business” column, seem oblivious to the real, measurable negative economic impact of their decisions. In addition to the professional groups who opt out of doing business in such states, sporting events have been moved out of state and private sector businesses cancelled announced expansions and moved their investments elsewhere. Given the frequency and range of disruptors taking place the Global Business Travel Association (GBTA) developed a Travel Risk Management Assessment Tool for the industry. The tool also doesn’t differentiate between the type of disruption. Whether a natural disaster, terrorism, health concern or other, it’s about preparedness. Beyond the immediate impact of events to local populations and places, Dow believes reputation damage or concern is fed and amplified by the proliferation of social media as well as the 24-hour news cycle. Events that were once local stories have become national and international stories that play on a type of continuous loop. And when the disaster is politically motivated, legislators must ask themselves if it is truly worth the dollar, job and reputational loss.